A team of researchers from the UCLA Henry Samueli School of Engineering and Applied Science has, for the first time, directly recorded the three-dimensional helical swimming patterns of human sperm cells. The team, led by Aydogan Ozcan, associate professor of electrical engineering and bioengineering, developed a novel lensless computational imaging platform that accurately tracked more than 24,000 individual sperm cells in a large volume. 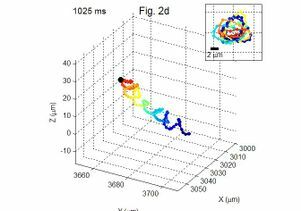 This involved observing the individual rotations of each sperm cell, including helical movement patterns, rotation speed, and linear and curved distances traveled. Observing human sperm cells has generally been limited to conventional lens-based optical microscopes. The small size of a sperm head (about 3 to 4 micrometers), requires a high-magnification lens to observe its motion, and sperm cells' relatively fast speed (about 20 to 100 micrometers per second) make it difficult to track them over time as they move in three dimensions, into and out of the microscope's small observation field. To address these challenges, the UCLA team developed a computational lens-free, on-chip imaging platform that uses the holographic shadows of sperm cells. Lens-free images of the sperm cells were acquired simultaneously using two different wavelengths of light, one red and one blue. These two light sources were set 45 degrees apart from one another, creating separate shadows at each color of illumination. The images were then processed with a customized computer program to retrieve their swimming trajectories. This multi-angle, multi-color illumination setup allowed simultaneous and very accurate tracking of the three-dimensional motion of approximately 1,500 individual human sperm cells (per experiment) across a wide field-of-view of 17 square millimeters. The team found that about 4 to 5 percent of the sperm cells within the sample moved in a very tight helical, or corkscrew, motion. Such movement patterns had a helix radius of about 0.5 to 3.0 micrometers, a helical rotation speed of three to 20 rotations per second, and a linear speed of 20 to 100 micrometers per second. Before this research, this helical pattern had not been directly observed in human sperm. Interestingly, the team also noticed that an overwhelming majority of the helical-moving sperm cells — about 90 percent — preferred right-handed helical motions to left-handed ones. The research is published online in the peer-reviewed journal Proceedings of the National Academy of Sciences. 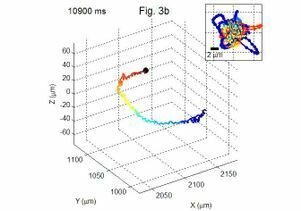 Other authors of the study included UCLA graduate students Ting-Wei Su and Liang Xue, both members of the BioPhotonics Laboratory, which is directed by Ozcan. 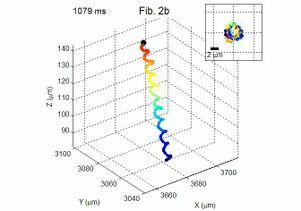 "Our results demonstrate the unique capabilities of this high-throughput, on-chip computational imaging platform by resolving the tight and rapidly evolving, rare helical trajectories of motile human sperms, as well as by revealing their statistical behavior," Ozcan said. "This powerful lens-free imaging platform can also provide a high-throughput tool to rapidly quantify the impact of, for example, various stimuli, chemicals and drugs on the 3-D swimming patterns of sperms." "The same technique would, in general, be widely applicable for observing the statistical swimming patterns of various microorganisms, leading to new insights into their 3-D motion and the underlying biophysics," Su said. The research was supported by a Presidential Early Career Award for Scientists and Engineers, an Army Research Office Young Investigator Award, a National Science Foundation CAREER Award, an Office of Naval Research Young Investigator Award, and the National Institutes of Health. For more information on the Ozcan Research Group, visit http://innovate.ee.ucla.edu or http://biogames.ee.ucla.edu. Image demonstrating three-dimensional motion of human sperm cells. Images demonstrating three-dimensional motion of human sperm cells.